The last two days have been filled with rehearsals and snow. The orchestra from the Detmold Hochschule für Musik and their conductor, Professor Joachim Harder, are terrific, and it’s a thrill to to play with the great trumpeter Reinhard Ehritt. The rehearsals have been conducted entirely in German which has been a new experience for me, but luckily I have been able to keep up without too much trouble. 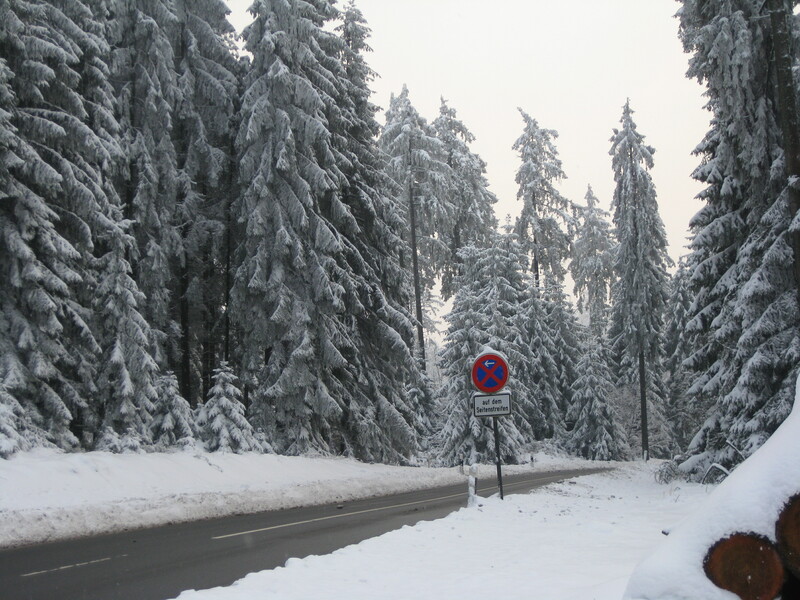 A peaceful snow scene in the Teutoburger Wald outside of Detmold, Germany. It snowed overnight and everything looks like Winter Wonderland here. According to the local news, there were a lot of traffic problems this morning as a result, but we didn’t have any trouble making it to Detmold for the rehearsal. We’re all hoping that it won’t snow on Friday for the first of our four concerts. The forecast looks good at the moment, so we’re keeping our fingers crossed. I find it very amusing that the weather forecast back home in Maryland is calling for snow today, too. After the rehearsal, we were treated to lunch by Max Sommerhalder, Professor of Trumpet at the Detmold Hochschule für Musik. 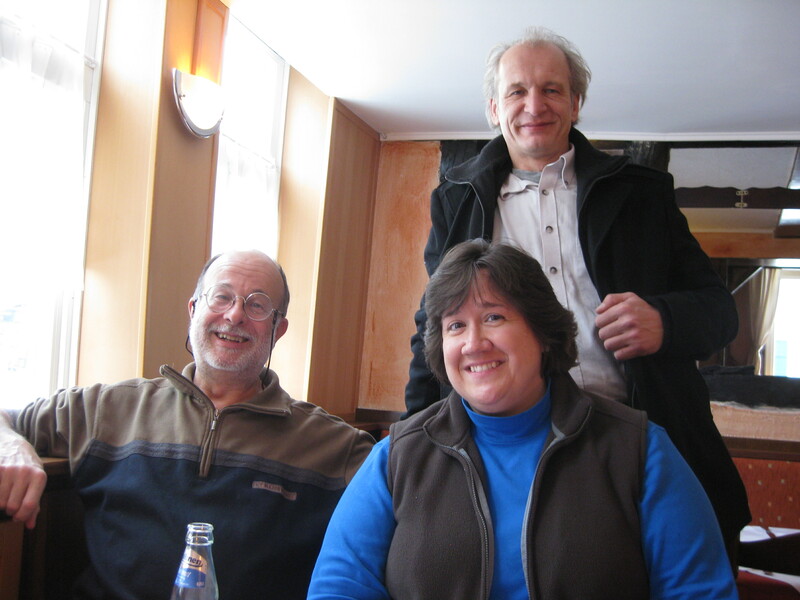 Max Sommerhalder (left), Elisa Koehler, and Reinhard Ehritt (standing). His son, Giuliano Sommerhalder, is currently the principal trumpeter of the Leipzig Gewandhaus Orchestra. It was great fun talking shop with such a gracious and entertaining luminary of the trumpet world. We even talked about conductors – ! Our concert organizer and host extraordinare, Kurt Oberschäfer, kindly took the lunch photo (left) and didn’t get into the picture, so I’ll leave you with a photo of Kurt standing in front of the main entrance of the Detmold Hochschule. Kurt Oberschäfer in front of the Detmold Hochschule. By the way, I still haven’t solved the problem with accessing the iPhoto Library yet, but I discovered a serviceable workaround: simply import the photos directly into WordPress from the camera SD card (found under “Devices” in the Mac’s Finder) before importing them into iPhoto (where they become inaccessible to WordPress). I hope to post even more photos by using the Flickr photostream on the sidebar to the right. Stay tuned! my “spies” tell me that you blew (and blew off!) a fantastic opening concert in Paderborn with/in winterly condition and a “full house”, also getting a “standing ovation” – unheard of in “sincere protestant” Westphalia. Congratulatuions! 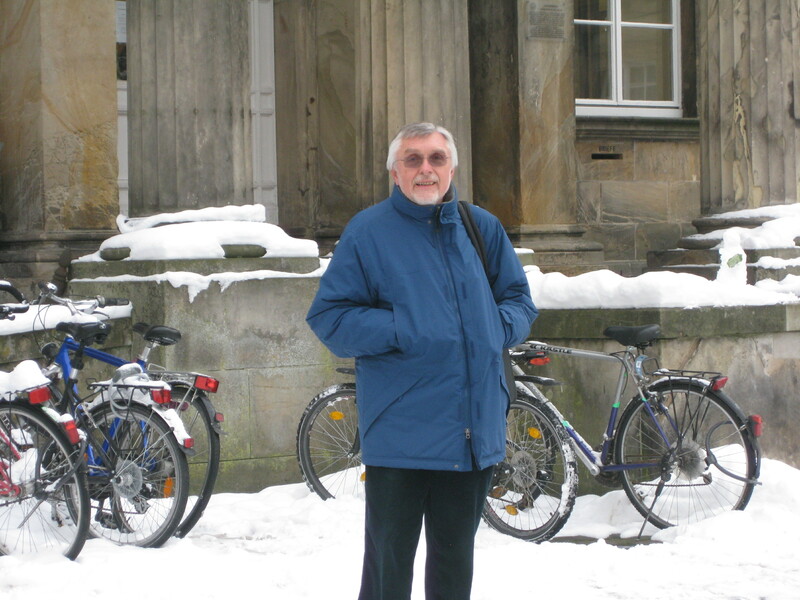 Keep that trumpet/Piccolo blowing – and save the best for last; in Leipzig (and the Thomas Kirche, Bach´s church). I am eagerly awaiting to seeing (and to hearing) you there next week.